Thanks to GODIVA for sponsoring this post. Today we’re taking a break from our regularly scheduled recipes to talk about important things, like chocolate. Gift giving season will be upon us before we know it. Sad, but true…Christmas decorations are already floating around certain craft stores. It’s time to start planning. 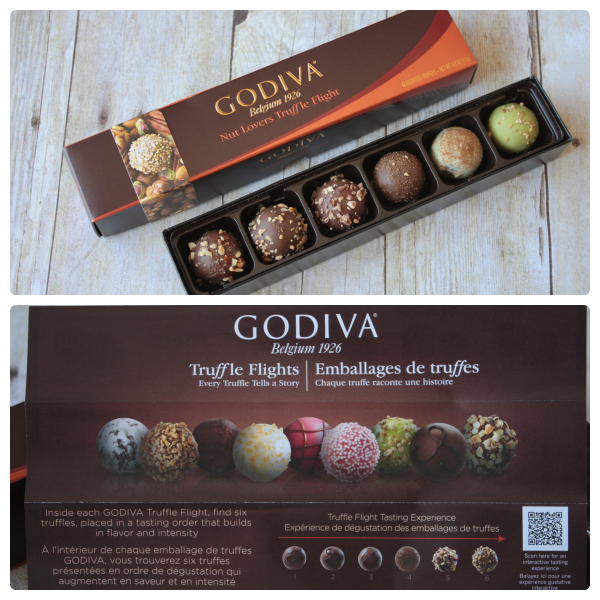 Today I’m happy to introduce to you – the GODIVA Truffle Flight™. The newest collection from GODIVA Chocolatier is designed to take you on an indulgent taste journey from beginning to end. Each Truffle Flight™ is a group of six truffles snuggled inside a sleek little box and would be the perfect gift for the chocolate lover in your life. I had the opportunity to enjoy the Nut Lovers Truffle Flight™ and loved how they are lined up in a specific tasting order for the ultimate chocolate experience. A small pamphlet inside the box defined the flavors of my Nut Lovers Truffle Flight™ and also listed other available types as well. Each box contains 6 signature truffles created with the finest ingredients and you can buy them at GODIVA Boutiques nationwide, retailing for $16.00. A Truffle Flight™ would be perfect for saying so many things…I Love You…You Did a Great Job…Congratulations…Have a Fantastic Day or even Just Because. They would also make a great stocking stuffer, just sayin’. 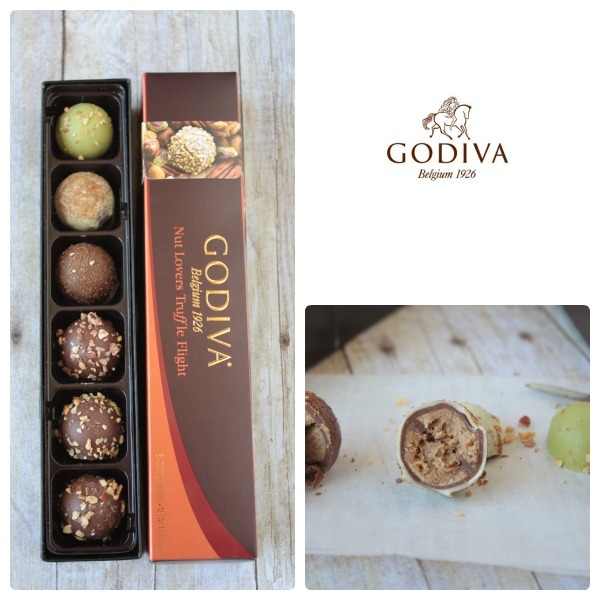 The products are available in GODIVA boutiques nationwide, as well as Godiva.com/Truffles! 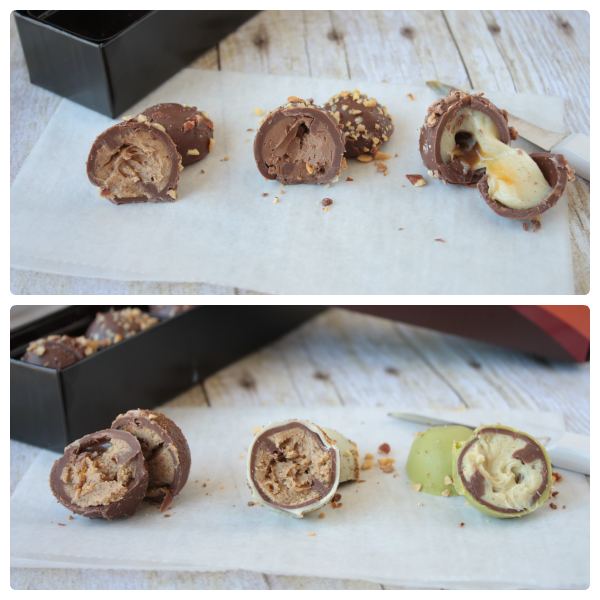 My Truffle Flight™ was made up of the following flavors – Salted Almond, Hazelnut Crunch, Pecan Caramel, Butterscotch Walnut, Maple Walnut and Pistachio. 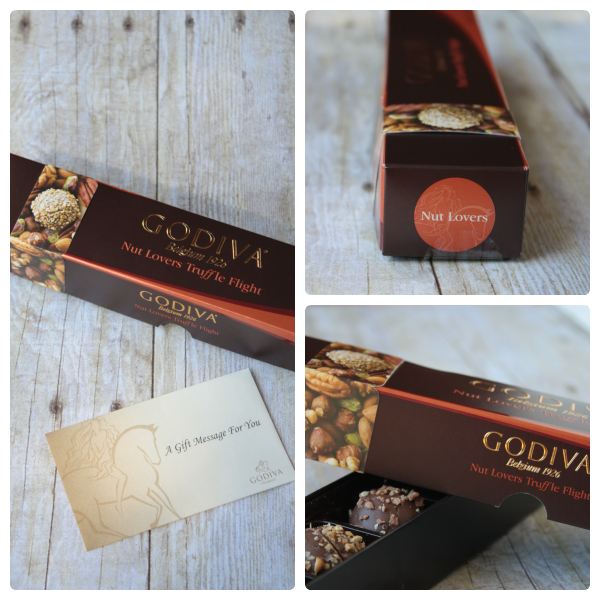 A serious nut lover’s dream with the quality and taste that you’ve come to expect from GODIVA. I loved the balance between the creamy filling, toasty nuts and chocolate truffle exterior. With 6 Truffle Flight™ Collections, you are sure to find a favorite (or two or three). To enter to win your own GODIVA Truffle Flight™, leave a comment on this post telling me which Truffle Flight™ you would love to receive as a gift. This giveaway will end, Tuesday, October 1st at noon. Disclosure: I participated in this post on behalf of Burst Media. I was compensated for my time and commitment, but all opinions are my own. This post is sponsored by GODIVA. They all sound delicious. I would choose the Dark Chocolate Truffle Flight. I would love the Nut Lovers flight. Any chocolate with nuts is a winner in my book. They all sound amazing! I think I would like to try the Ultimate Dessert Truffle Flight! I wouldn’t turn any of them down, but my preference would be Nut Lover Truffle Flight. I want them all-but the Nut Lovers Truffle Flight would be my first choice. I’d love to try the Dark Decadence Truffle Flight! Wow I have to try these!! They all sound amazing, but I think the Ultimate Dessert Truffle Flight would be my first choice. Its so hard to choose, but I would try the Cake Truffle flight first. I would love to try them all but I think the Ultimate Dessert Flight sounds wonderful! I would love the Dark Decadence Truffle Flight! I would like the Dark Decadence Truffle Flight. They all sound amazing – but I’d probably choose the Nut Lovers Truffle Flight – or the Dark Decadence Truffle Flight. I can’t decide! The nut lovers followed by the ultimate desserts. Hard to choose one. I honestly would love any of them but my favorite is the Milk Chocolate Lovers Truffle Flight™. Thanks for the chance to enter. They all sound and look delicious. I am torn between the Milk Chocolate Lovers Truffle Flight and the Ultimate Dessert Truffle Flight. The milk chocolate lover’s looks amazing! Nutlovers Truffle Flight, Ooooh I’m drooling! Nut Lovers or Milk Chocolate. Both sound awesome! Mike Chocolate Lovers Chocolate Truffle Flight! OH MY GOSH!!!! The Dark Decadence!!!! I want to try the Heavenly Mousse! The Ultimate Dessert Truffle Flight sounds devine!